The National Road built in 1811 makes a path through the states of Illinois, Indiana, Maryland, Ohio, Pennsylvania, and West Virginia. Photo Map courtesy Fort Necessity National Battlefield. By the early 19th century, the wilderness of the Ohio country had given way to settlement. The road George Washington had cut through the forest many years before, called the Braddock Road, was replaced by the National Road. Cutting an approximate 820-mile long path through the states of Illinois, Indiana, Maryland, Ohio, Pennsylvania, West Virginia, it was built between 1811 and 1834 and was the first federally funded road in U.S. history. Both Presidents George Washington and Thomas Jefferson believed that a trans-Appalachian road was necessary for unifying the young country. 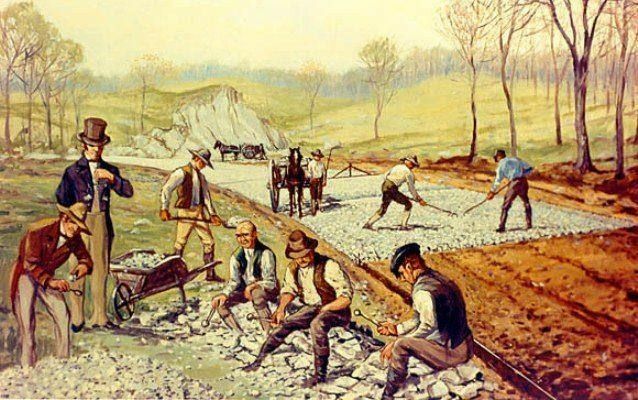 On March 29, 1806, Congress authorized construction of the road and President Thomas Jefferson signed the act establishing what was first called the Cumberland Road that would connect Cumberland, Maryland to the Ohio River. The contract for the construction of the first section was awarded to Henry McKinley on May 8, 1811, and construction began later that year, with the road reaching Cumberland, Maryland and Uniontown, Pennsylvania in 1817. The next year, it was completed to the Ohio River at Wheeling, West Virginia on August 1, 1818, and mail coaches began using the road. Wheeling would remain its western terminus for several years. 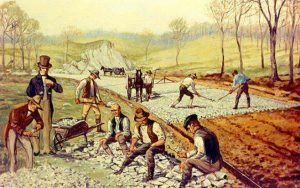 Eventually, the road was pushed through central Ohio and Indiana reaching Vandalia, Illinois in the 1830’s, and at that time, it became the first road in the U.S. to use the new macadam road surfacing. During that decade, the federal government conveyed part of the road’s responsibility to the states through which it runs. Tollgates and tollhouses were then built by the states. Plans were made to continue the road to St. Louis, Missouri at the confluence of the Mississippi and Missouri Rivers, and to Jefferson City upstream on the Missouri River. Following the panic of 1837 however, funding ran dry and construction was stopped, leaving the terminus at Vandalia, Illinois. The opening of the National Road saw thousands of travelers heading west over the Allegheny Mountains to settle the rich land of the Ohio River Valley. It also became a corridor of moving goods and supplies. Small towns along the National Road’s path began to grow and prosper with the increase in population. 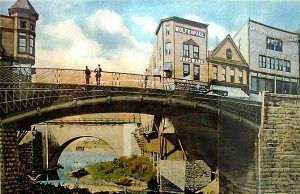 Towns such as Cumberland, Maryland; Uniontown, Brownsville, and Washington, Pennsylvania; and Wheeling, West Virginia evolved into commercial centers of business and industry. Uniontown was the headquarters for three major stagecoach lines which carried passengers over the National Road. Brownsville, on the Monongahela River, was a center for steamboat building and river freight hauling. Many small towns and villages along the road contained taverns, blacksmith shops, and livery stables. Thomas Searight remembered as many as 20 stagecoaches in a line at one time on the road. Another man named Jesse Peirsol, a wagoner remembers a night at a tavern where there were 30 six-horse teams parked in the wagon yard, 100 mules in a pen, 1,000 hogs in an enclosure and as many cattle in the field. Taverns were probably the most important and numerous business found on the National Road. It is estimated there was about one tavern situated on every mile of the road. There were two different classes of taverns, including the stagecoach tavern, which was more expensive and designed for the affluent traveler; and the wagon stand, which was more affordable for most travelers. 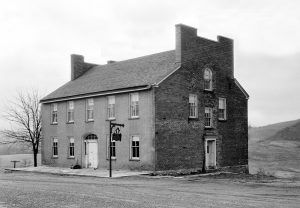 The Mount Washington Tavern, which still stands in Uniontown, Pennsylvania as part of Fort Necessity National Battlefield, was a stagecoach tavern. All taverns regardless of class offered three basic things; food, drink, and lodging. During the heyday of the National Road, traffic was heavy throughout the day and into the early evening. Almost every kind of vehicle could be seen on the road. The two most common vehicles were the stagecoach and the Conestoga wagon. Stagecoach travel was designed with speed in mind and would average 60 to 70 miles in one day. The Conestoga wagon was the “tractor-trailer” of the 19th Century. Conestogas were designed to carry heavy freight. They were often brightly painted with red running gears, Prussian blue bodies , nd white canvas coverings. A Conestoga wagon, pulled by a team of six draft horses, averaged 15 miles a day. The height of the National Road’s popularity came in 1825 when it was celebrated in song, story, painting and poetry. During the 1840’s popularity soared again as westbound travelers and drovers crowded the inns and taverns along the route. Huge Conestoga wagons hauled produce from frontier farms to the East Coast, returning with staples such as coffee and sugar for the western settlements. Thousands moved west in covered wagons and stagecoaches traveled the road keeping to regular schedules. In 1848 Robert S. McDowell counted 133 wagons pulled by six-horse teams pass along the National Road in one day. He took “no notice of as many more teams of one, two, three four and five horses. 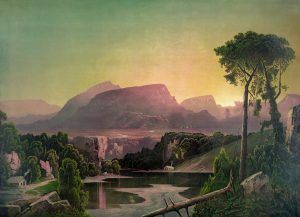 Sunrise in the Alleghenies, Gibson and Co, 1880. Click for prints & products. By the early 1850’s technology was changing the way people traveled. The steam locomotive was being perfected and soon, railroads would cross the Allegheny Mountains. The people of Southwestern Pennsylvania fought strongly to keep the railroad out of the area, knowing the impact it would have on the National Road. However, in 1852, the Pennsylvania Railroad was completed to Pittsburgh and shortly after, the B & O Railroad reached Wheeling, West Virginia. This spelled doom for the National Road, as the traffic quickly declined and many taverns went out of business. In 1912 the pathway became part of the National Old Trails Road. Just a few years later, just as technology caused the National Road to decline, it also led to its revival with the invention of the automobile in the early 20th century. 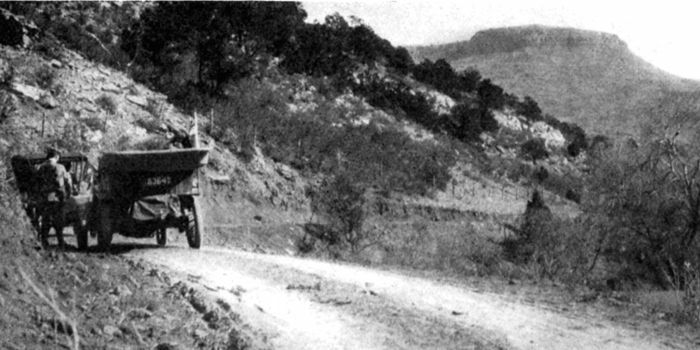 As “motor touring” became a popular pastime, the need for improved roads began to grow. Many early wagon and coach roads such as the National Road were revived into smoothly paved automobile roads. The Federal Highway Act of 1921 established a program of federal aid to encourage the states to build “an adequate and connected system of highways, interstate in character.” In 1926, the grid system of numbering highways was in place, thus creating US Route 40 out of the ashes of the National Road. 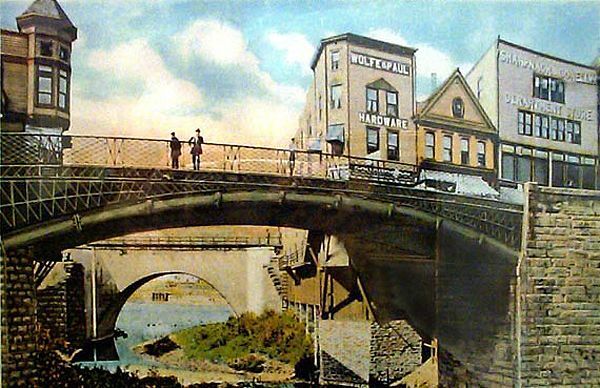 This spurned a generation of new businesses — stage taverns and wagon stands were replaced by hotels, motels, restaurants, and diners. The service station replaced the livery stables and blacksmith shops. Some of the National Road era buildings regained new life as with the influx of new businesses. Route 40 served as a major east-west artery until the Federal-Aid Highway Act of 1956 created the interstate system, and much of the traffic was diverted away and interest in the National Road again waned. Decades later; however, new generations are finding these older two-lane roads to be not only a more relaxing journey but, are once again enjoying the history. 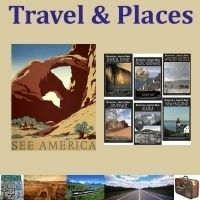 Today, the old pavement is a National Scenic Byway where visitors can experience a physical timeline, including classic inns, tollhouses, diners, and motels that trace 200 years of American history. Along this historic path, cameras capture old buildings, bridges and old stone mile markers. Old brick schoolhouses from early years sporadically dot the countryside and some are found in the small towns on the National Road. Many are still used, some are converted to a private residence and others stand abandoned. Casselman River Bridge near Grantsville, Maryland. Dunlap’s Creek Bridge, near Brownsville, Pennsylvania, the first cast iron arch bridge in the United States completed in 1839. Hudleston Farmhouse Inn in Mount Auburn, Indiana. James Whitcomb Riley House in Indiana. National Road Corridor Historic District in Wheeling, West Virginia. Old Stone Arch, National Road, near Marshall, Illinois. Petersburg Tollhouse in Addison, Pennsylvania. The Red Brick Tavern in Lafayette, Madison County, Ohio, built in 1837. Road Segment of the road in Cambridge, Ohio. Searights Tollhouse, National Road, in Uniontown, Pennsylvania. S Bridge in Washington County, Pennsylvania, near Washington, Pennsylvania. Wheeling Suspension Bridge in Wheeling, West Virginia.